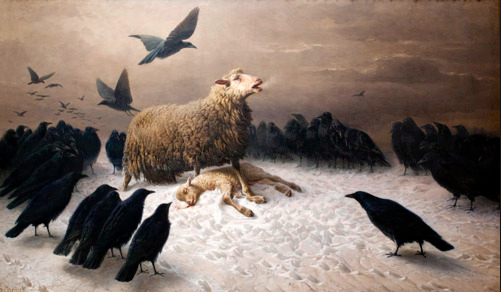 The picture that accompanies this post – the one of the sheep yearning over its fallen lamb as the crows close in – is a famous painting called ‘Anguish’ (painted by August Friedrich Albrecht Schenck in 1878). Anguish. Going to be candid here and talk about one of the most epic failures of my life AND what I learned from it. When I joined the Army, at age 24, it was a HUGE goal of mine to become an Army Ranger. The Army Rangers are of the most elite and highly trained forces in the entire military – they get to go on the most specialized high priority missions in the world, they get the latest equipment and cutting edge technology, and are continually pushing themselves to their fullest potential. I wanted to be a part of this BAD. Becoming a Ranger would require about 8-9 months of training – a Soldier has to graduate Basic Combat Training (14 weeks), Airborne School (3 weeks), and then pass the Ranger Assessment Program (8 weeks), and ‘holdover’ in between each of these schools, in order to join the Ranger Regiment. Every day during basic training I would go and ask my Drill Sergeants if I could get ‘Ranger’ in my contract. My request was usually met with ‘drop and start pushing’ and I’d be left doing push ups until my arms were rubber while the other Soldiers were at chow or doing mail call. It didn’t matter, though, what they did to punish me – I’d go right back the next day and ask again – and I’d be met with the same response again. It kind of became a daily routine: Wake up, train, ask to get ‘Ranger’ in my contract, get told to shut up and do pushups, sleep, repeat. This went on for weeks – months. It didn’t matter. I wanted to be a Ranger BAD – no amount of punishment would stop me. Music to my ears. I could barely hold in my joy. I grabbed the pen and couldn’t sign the contract fast enough. I would, still, have a lot of training in front of me but I was ecstatic just to get the chance. A few days later, I graduated Basic Training in February of 2009. After that, was Airborne School – a three week course that trains you to parachute out of planes into a combat environment. I graduated Airborne School in March of 2009. Then, it was onto the Ranger Assessment Program or RASP as it is known today (when I was there it was called the Ranger Indoctrination Program). RASP is an 8 week program designed to push you to your physical and mental limits. It is designed to weed out all but the most elite. I was so ready for it. This was the final stretch. But, it would be, by far the most difficult leg of the journey. In RASP, they use food deprivation, sleep deprivation, while putting you under constant physical and mental stress to see who wants it bad enough. For example, there would be a week where you NEVER sleep more than an hour in any single night, you’re barely given any food, and then, have to go on a 12 mile road march carrying 100+ lbs on your back. I didn’t care – nothing was going to stop me. I remember, one night, at Cole Range, we’d barely slept all week – and when we did sleep, it was in a field on the dirt. Exhaustion was consuming us. I remember seeing guys literally fall asleep while standing up. We were tired, cold, and hungry. After days of this training under food and sleep deprivation we were weak and fatigued. Then, one night at about 3am, we were told we could go to sleep for an hour. Beautiful. This was going to feel great. The exhaustion was so heavy, being told we could sleep for an hour felt like winning the lottery. We set up in a security formation, put on dry socks, and started to bed down. Then, literally within seconds of closing my eyes, the Instructors came out and screamed for us to get up – he told us we weren’t going to sleep. Bleary eyed and drained, I pulled myself up, packed up my sleeping gear as fast as I could and waited to see what was coming. “Follow me!” the instructor said. We proceeded to sprint about a mile until we came to a swamp. “Get in” he said. So, on a very cold Georgia night, teeth chattering, tired, and hungry we all walked into the waist deep swamp. “This could be a whole lot worse” I remember the Instructor saying, “Right? I could make you completely submerge yourselves in the swamp. Well guess what? Its going to get worse – submerge yourselves!”. I dunked my complete body into the frigid water and came back up surrounded by shivering, cold, tired, and hungry men. “If you want to get out of this water,” the Instructor told us “All you have to do is mutter 2 simple words: I QUIT. There is no shame in quitting. If you quit, you can walk right out of this swamp, go into that heated tent over there, change into a nice dry pair of clothes, eat a big meal and we’ll have you on your way by morning. Just quit. Those who don’t quit are going to be staying in this swamp for a while tonight. Forget about sleep.” I watched as, one by one, Soldier after Soldier, walked out of the swamp said ‘I quit’ and walked into that nice warm tent. This encouraging people to quit seems counter intuitive but it is an intentional part of training. The thought is that, if a Soldier cannot withstand the stress of being tired, cold, and hungry – then they will not be able to withstand the stress that accompanies going on some of the most dangerous missions in the world – so instructors would rather have a weak person quit in training, than cost someone their life in combat. But I wasn’t moving. No way. In fact, as each person quit it made me feel a little stronger. Nothing could get me to give up on my goal – no swamp, coldness, or fatigue could push me to mutter those words ‘I quit’. I don’t remember how long we stayed there, but I remember we lost about half of our class that night to quitting – we started out the night with about 120 students in the class and after that swamp ordeal we were down to around fifty. I made it through that week at Cole Range and the finish line was getting closer and closer. After going through 7+ months of training (basic training, airborne school, and now most of RASP) I was only four training days from graduation and being an Army Ranger. I was so close I could taste it. I had just been through so many months of rigorous and dogged training – months away from the comforts of home, months undergoing immense stress, months of pushing my body and mind to its limit, and months where the finish line seemed so far away – pushing myself – driving – willing myself towards my dream. And, now, here I was. Just a few training days left before I achieved this dream. It was an April morning in 2009 and we woke up at 4am to take a PT test (pushups, situps, pull-ups, and a 5 mile run in under 40 minutes). I completed the pushups, situps, pull-ups no problem. Then I started the 5 mile run…. At 190 lbs, I’m not a natural runner, but I always pushed myself to finish whatever we were doing first. I was really pushing it in the run. I wanted to finish in the front, even though the only requirement was to make it in under 40 minutes. I was giving it. I started feeling light headed – but I kept pushing – it didn’t help that we were already weak from all of the training – but I kept pushing. The next thing I remember after ‘left foot’ was being in the back of an ambulance, naked, covered in ice, and tubes were attached to me. I guess I must have been delirious because I started telling the medic in the ambulance stories about my family. When I, finally, became fully conscious again, I was laying in a hospital bed with all kinds of tubes running to me. The doctor came in and informed me that I had suffered heat stroke – that I had a 107.3 degree core temperature when the ambulance arrived – and that I was lucky it wasn’t far worse because at 106 degree core temperature is when organs begin to fail. Like a knife to the chest. Groan. Pain. I just went through so much training and pushed myself so hard for this, and to have it all taken away so close to the finish line was devastating. I, later, came to find out that, during the 5 mile run, I made it to the finish line, went and got in formation, and then just collapsed. In the moment, as I lay in that hospital bed, having just received the news it was infuriating. Completely gut wrenching. I don’t think I had ever wanting anything more in my life and I had gotten so close – and to lose it due to a stupid fluke that was out of my control. I was furious/upset/mind numbingly disappointed. But now, I am thankful for that failure. For all of my failures. They develop grit. And resilience. They make you hard. They build your character if you let them. Without that epic failure, I wouldn’t be where I am or who I am today. Not to mention, I would never have had the opportunity to serve with the amazing unit I served with in the 101st Airborne – brothers and relationships I will carry with me for the rest of my life. Good.I’m glad I failed. It made me better. I failed while risking greatly. Life is not a cookie cutter perfect movie where you always get your way – life is better than that – it is an amazing roller coaster full of ups and downs and successes and failures and good seasons and bad seasons – and if you can take those bad seasons and use them to make you better – to GROW – this life is a beautiful ride.